To this day, the P-bass continues to charm many musicians with its heavy tone and burly, yet gracious sound. The Xotic XP-1T 5-string (P-bass Style) was created borrowing some of the popular technologies of our XJ-1T 5-string (J-bass Style), like our Tri-Logic Bass Preamp, our pursuit of natural playability and a body style that promotes acoustical sustain. To accompany our new XP-1T bass, we've designed a new pickup, the Xotic PV-1. We're confident that this new pickup will satisfy your needs for a fat and solid sound. For the XP-1T, adjustments can be made at the end for the neck with the special hex Allen wrench. There is no need to remove the neck or the pick guard to make the adjustment. The XJ series uses a custom brass/chrome design for the bridge because its brass alloy doesn't lose any vibrations from the strings, giving it fat and solid tone. This bridge provides adjustments to the pitch and tension of each string giving you your own custom setup. A lightweight Ash materials are used for the body. These woods give the XP series a solid low and low-mid range tone. Our ash bodies feature 2 piece construction. 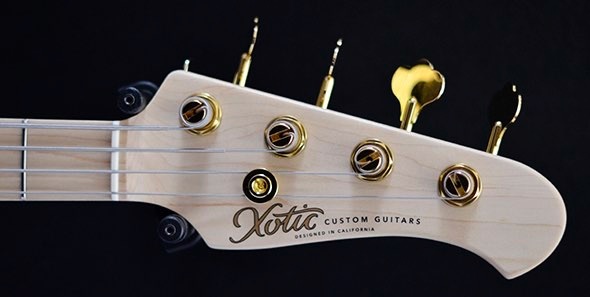 The XP's body style is based on an original P-Bass design, but Xotic's vision and enhancements are reflected throughout its design. For example, the rounded heel of the neck joint and the cut away. These improvements significantly improve playability in higher positions and give a stress free feel. We wanted a finish that was strong and would look great after many hours of playing. Our polyurethane finish accomplished our goal and we can now offer a variety of colors, from vintage to more modern shades. 2 coil bobbins for 1~2 string and 3~4 string are wired in series for the P-Bass style pickup. 2 coils are configured to cancel the hum noise, wired with reversed-magnet and reversed-winding. This symmetrical design gives us very effective hum cancelling. In the case of 5-string, 2 coils do not have symmetrical design. This could lower the effectiveness of the hum cancelling, and also cause tendency for the larger coil bobbin to sound boomier. For J pickup we used the traditional Alnico 5 rod magnet, AWG-42 formvar wire, and Vulcan fibre bobbins. Both 4-string and 5-string model have vintage flavour as its base, but with higher gain. The higher gain offers richer sound in both passive and active modes. We used our world renowned Tri-logic 2 preamp. The preamp is designed to minimize the change in tonal quality and incorporates a 3 band EQ. The preamps and EQ makes it ideal for covering a wide range of musical styles. We improved the preamps functionality by positioning 2 mini toggle switches, just below the bridge, so you can instantly switch between high-mid/low-mid and various treble EQ frequencies. This flat pickup cover also functions as a finger ramp. There are also thumb rests on the side that are helpful for stabilizing your picking. And since the pole pieces are not bare, this visually attractive cover also eliminates the noise from fingers or pick which are prevalent for the P-Bass. Tri-logic 2 Bass Preamp:Three Band EQ (high, mid, low) boost & cut. Center position produces flat,unaltered sound, with no added tonal coloration. 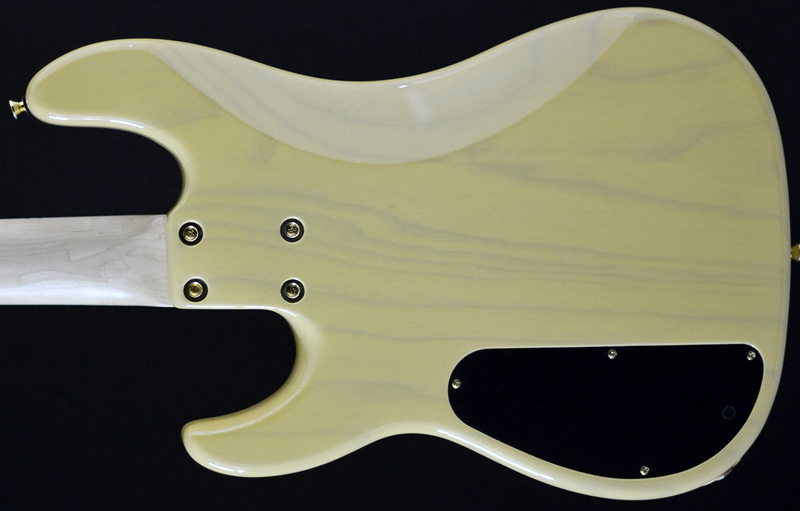 Stuart Clayton gets to grips with the latest offering from us-bass builder, Xotic. 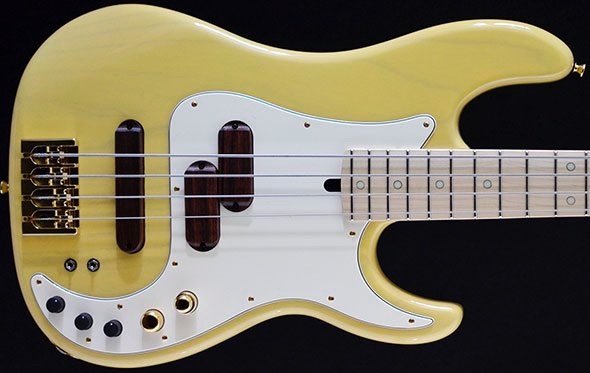 Having started out as a custom bass manufacturer in the mid 90s, LA bass builders Xotic followed the success of their flagship XB model with the XJ-1T 5, borrowing from the time honoured Jazz Bass blueprint. Tricked out with Lindy Fralin pickups and a seriously well appointed control set, the XJ-1T 5 looks set to appeal to the working pro who needs to cover a lot of different stylistic ground, and has already been well received by the likes of Nashville session ace Michael Rhodes and Ric Fierabracci. Let’s take a closer look. The one-piece alder body features the familiar Jazz-style shaping and feel, but it’s a look that is brought firmly into the 21st century courtesy of the uniquely shaped scratchplate with circular cutaway, ebony pickup covers and extensive control set. Our review model was finished in gorgeous black cherry with a three-ply pearloid scratchplate, and we didn’t have to look far to find signs of the superior workmanship and innovation that Xotic basses are known for. We loved the recessed circular areas for each control pot, as well as the curved pickup tops – these make for comfortable thumb rests. Flipping the bass over revealed chunky chrome string holders for the throughbody stringing option and a control plate featuring access points to two trim pots – more on these later. The four-bolt neck joint was of plate-less design, with the four screws sitting in large, recessed chrome ferrules. We were rather taken with the use of chunky chrome Hipshot hardware – not only does it add an impression of supreme dependability, but it looks pretty cool as well. The select three-piece maple neck benefits from a smooth, oil finish and a sleek profile that’s quick and easy to get around. The rosewood fingerboard was a suitable counterpart to the maple neck, but we found the mother-ofpearl position markers to be quite dark and difficult to see in places against the rosewood. Fretwork was exemplary right across the fingerboard. Chrome Hipshot hardware is used throughout the XJ-1T, from the heavyweight Type A bridge (actually brass chrome) to the open-backed elephantear tuning machines. 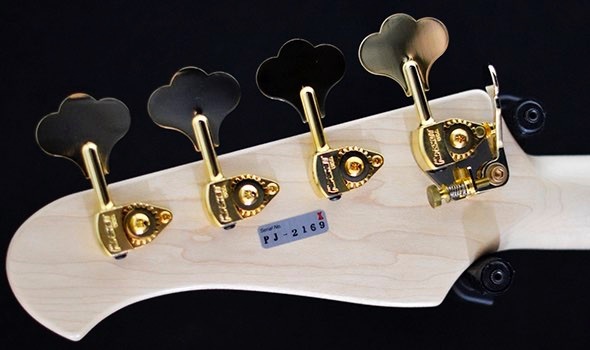 However, one of the most eye-catching parts is the use of ebony pickup covers. Lindy Fralin JB pickups are employed here, and the wooden covers really are aesthetically very pleasing against the black-cherry body and the pearl scratchplate. The XJ-1T features an extensive control set that offers the user a lot of options. The three chrome controls are, as one would expect on a J-style instrument, volume controls for each pickup and a master tone. The two pickup controls also have push/pull functionality, with the neck control allowing active/passive switching and the bridge control offering series/parallel switching. The remaining three controls are bass, middle and treble EQ controls. The trim pots, which are accessible with a small screwdriver through the control plate on the rear side of the bass, allow the adjustment of the mid-EQ frequency and the active gain. There are four positions for the mid-EQ control. In passive mode the XJ- 1T functions as any J-style instrument should do, and the usual tonal palette is easy to navigate; favouring the neck pickup yields old-school Miller-esque slap tones, while the neck pickup adds bite, perfect for fingerstyle funk. Those acquainted with this familiar configuration will have no problems getting around the instrument in passive mode. In active mode the three band EQ is engaged and offers an additional array of supremely usable tones. With the combination of series/parallel switching the XJ- 1T really is extremely well appointed and offers a bass sound for all situations. Th e combination of the Xotic bass preamp and the Lindy Fralin pickups is a winner. Impressive stuff . Sonically this bass is superb. It sang beautifully on our covers gig and we found suitable tones for all styles and loved the ever present growl that underpins the tonal palette. It’s well weighted, if a little on the neck-heavy side, but no hardship to wear for an evening of playing. The neck is slick and easy to get around and the action was set just right. At £2,299 the XJ-T1 is far from cheap, but when you take into consideration the fact that it is handmade in the US and offers pretty much everything a working pro would ever need, that price tag seem less of an obstacle. A lovely bass, and well worth a look if you’re in the market for a high-end instrument to last you a lifetime. Plus: A very versatile bass that’s a pleasure to play. Minus: None, other than the price tag! Overall: A superb pro bass from Xotic.